The first version of Epic Battle Fantasy! What…that’s it? Well, it is a prototype, but for the amazing and long EBF I was expecting it to be longer, even if it is a prototype. I saw a scratch parody where you play as furry slimes!!! he stole his own game! here ya are! EBF5! imagine if it would really be it: everybody would be like:whata!? several instances of the music are playing and it sounds horrible, both of them can use ice, using p2′s mana, and going into negatives, sometimes you can do other things, but it’s crazy. for example: p1 using epic on himself and instantly dying. and p2 using cure on the enemy. also, it makes me use ice even if i don’t click. Well damn. Players are bad quality compared to the enemies. Such bad game 0/10. 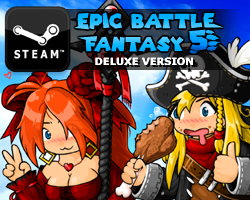 Make EBF5 just like this one though. 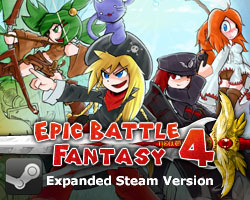 I mean, this IS EBF4.5 right? Hold on… MATT HOW DARE YOU STEAL THIS GUYS GAME. Matt, Can you create all the character in EBF 5 about founding their family. It’s not on deviantart, must be stolen.